Snowflakes are falling and Pinwheels are turning. Get this stunning pinwheel bow with Elsa from Frozen and your little girl with turn kart wheels when she gets this bow! 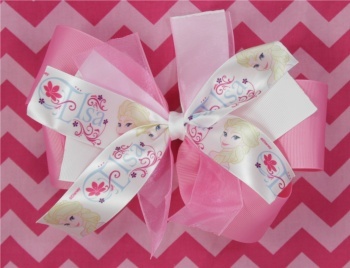 This has a light pink grosgrain ribbon on the bottom and is layered with a pinwheel bow on top. The pinwheel has white grosgrain, pink sheers, and a satin Elsa ribbon streaming across the larger underside bow. It is wrapped in the center with a white grosgrain ribbon and is attached to a French clip.